I celebrated Karneia much in the same fashion I do every year. Not enough folks to participate in the Spartan race, but still very meaningful. I used the small image of the dolphin and boat that I had made during Delphinia to correspond with the use of Apollon’s image in the ship that was filled with flowers and carried as part of the Karneia festival. Apollon the traveler, the god who goes about everywhere. It rather corresponds with the image of Dionysos in the ship but bears a different meaning as we see the Dionysos in the boat as a being which is literally traveling by the boat…he is the god which is accompanies the journey of the soul. Alternatively Apollon is within the boat much in the way that the dolphin leapt into the boat and steered forth the Cretans to Delphi. He inhabits there in the purpose of directing us. This is as much a part of Karneia wherein the god directs the movement of people for which was jointly celebrated in the spirit of the Karneia…the migration of the Doric people. So it seemed appropriate to use this same image I had made for Delphinia here in this case. And this was set before the bust of Apollon and between them was the warmer into which the oil and water was poured as offering. 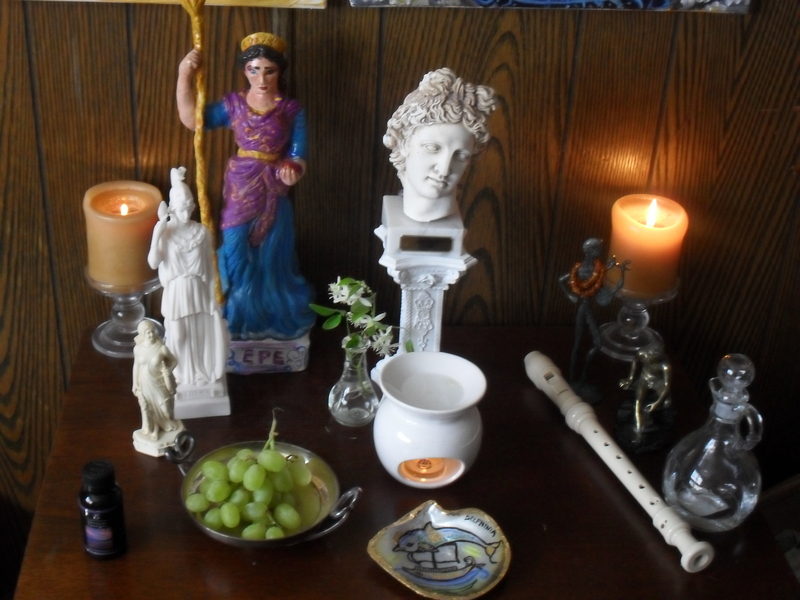 Later in the body of the ritual we offered our grapes to Apollon. It confuses some folks as to why there is a connection between grapes and Apollon in this festival..for we see it in the offering as well as the race which was conducted holding grapes. Apollon is the cultivator essentially, and this imagery of the god associated with the cultivated grape as well as the wheat ears is not unheard of. Images of the god with wheatears has often been celebrated as a representation of the god who brings prosperity..usually among colonies. So the cultivated grape is much of the same in the symbol of the cultivation of the self. And this imagery is seen in the doric colony at Rhodes where an image of a winged Apollon depicted him with grape clusters hanging from his wings. More on this can be read on my website Apollon’s Lyre. In any case the grapes are a necessary part of the ritual. I only wish I had been able to get him a shepherd’s cloak as an offering, or something the nature along those lines, but I did add to the ritual my own poems that I had written for Apollon Karneios for the Karneia. And for this festival I played upon the recorder as well as upon the lyre. Though I celebrate these as two distinct festivals they share some root commonalities that can of tie the passage of one into the next for me. This commonality is based on the idea of migration-emigration-immigration, and keeping in mind that traditionally Karneia was celebrated for nine days so typically during the time of Metageitnia Karneia was also already underway. However, since I don’t have access to a large worship community to carry out nine days of worship I celebrate Metageitnia and do prep work and focus for the days leading up to the Karneia. Metageitnia perhaps is overlooked by some because it deals directly with Athens, however I think the underlying principle in which the people are being brought together to form a singular great democratic state is something that is not unfamiliar by far. So I celebrate in the spirit of Metageitnia. This honors where I have come from (my ancestrial connections) and where I am today. I have been planning a painting of Columbia (the divine personification of our country more or less) and it is a shame that there is no chance it will be done by Saturday to be part of the ritual…but maybe a sketch can be done of her to represent my homeland along with “flags” made of paper from my homestate and current resident state (so Alaska where I was born and raised and have a deep emotional connection and North Carolina that I call home at this point in time) with the flag of Hellas as a spiritual home. I will be posting more abou tthe ritual on my website over the next day or two so that folks will be able to see how exactly I lay this ritual out. Karneia likewise is said by scholars to have some connections with the migrations of the Doric people. But emigration to form social-political unity as with the Metageitnia, and the process of colonization–immigration of people to encourage prosperity for the people who need to relocate can be aligned with a higher ideal…spiritual evolution and the higher idea of the transmigration of the soul. August is the time of the first autumn harvests, the bringing of the crops which are ready to be sheared..crops of fruit largely, therefore it is logical that we begin celebrating this spiritual harvest here in this month. So the shepherds reared the most beautiful ram to be sacrificed to Apollon Karneios, a symbol perhaps of the self that they offered in a “sacrifice” not unlike the idea of the offering of the goat to Artemis in place of a maiden. We are the ram that has been raised to beauty and we are saying that we have matured and are ready to go into the next phase of spiritual evolution and we praise Apollon who is the god presiding over this boundary.